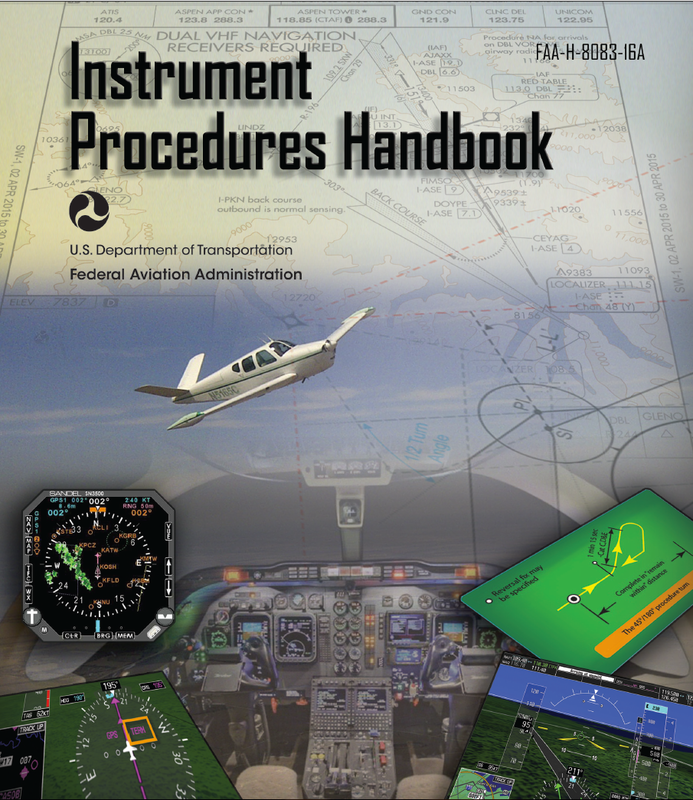 The FAA has published the 2015 edition of the Instrument Procedures Handbook (FAA-H-8083-16A). You can download the PDF from the FAA website here. If you use ForeFlight on an iPad, the new edition should be the ForeFlight section of the Documents feature. This handbook supersedes FAA-H-8083-16, Instrument Procedures Handbook dated 2014, and contains substantial changes, updates, and reorganization. It must be thoroughly reviewed. This Chapter contains updated information and reorganization of important concepts and principles related to obstacle avoidance and departure planning. The presentation retains the same logical order as earlier versions, and includes updated graphics for clarity. The section related to Surface Movement Guidance and Control System contains significant revisions to better reflect advancements in the way the system operates, as well as the Advisory Circulars published related to the subject. The section related to Diverse Vector Areas (DVAs) contains significant revision reflecting policy changes. Several subject matter areas and graphics discussed in this Chapter contain changes made in order to better align with updates and changes made to the Airman’s Information Manual (AIM). Various editorial and graphics issues were addressed revised as appropriate. This Chapter contains various updates to Sectors and Altitudes, as well as various editorial changes throughout. Several graphics were updated or changed as appropriate. Changed internet references related to on-line flight planning and filing. Updated verbiage and information regarding Vertical Descent Angles (VDAs) and Visual Descent Points (VDPs). Revised verbiage and illustration related to GLS approaches and associated minimums. Added discussion regarding alerting functions that are part of the Performance-Based Navigation concept and associated systems. Addressed changes to RNP approach naming convention issues. Hot and cold weather altimetry limitations and their associated FAA-directed procedure implementation changes were addressed and discussed. New information related to Terminal Arrival Areas (TAAs) was presented and discussed. This information now aligns with advances in the subject matter presented in the AIM. Several updates were made regarding RNAV and GPS-based approaches in general, under several sub-sections. Associated graphics and illustrations updated. Multiple changes were made to the section discussing ILS and parallel ILS approaches. Several editorial and graphics issues were addressed as appropriate. While significant information was updated for this version, there are multiple policy changes pending that will be further changed or discussed in subsequent versions of this Handbook. This Chapter contains several editorial and graphics updates as deemed appropriate (fixed browser links, etc). This Chapter remains “Helicopter Instrument Procedures”and contains updated illustrations and graphics pertinent to information discussed within the Chapter. The Appendices in remain intact in this version. There are information and policy changes pending that, due to time constraints, will be addressed in subsequent versions of this Handbook.